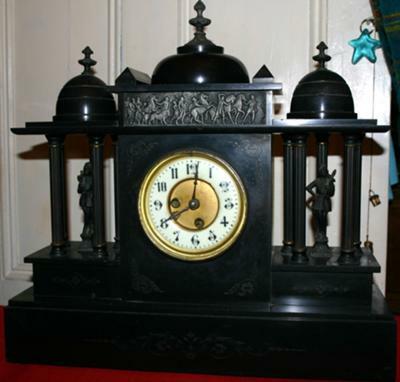 This clock was handed down from a great grandfather, and we suspect its circa 1820 - 1850. It was made by Jules Rolez Limited, Paris. Jules Rolez appears to have been born in Manchester, England. It's made out of black marble and brass. It has two brass roman soldier figures which have different weapons and armour surrounded by brass columns. It was valued some time in the 80's where it was supposedly valued at $25,000 but that seems a little unbelievable to me. Can a clock really be worth that much? If anyone can offer any tips on how to clean the marble it would really be appreciated. The internet seems to be littered with posts about using a poultice made of acetone and talc and each one of them seems to be followed immediately by some professional stone restorer saying that it's all garbage and the work should be left to professionals. I would probably be inclined not to use a harsh chemical like acetone anyway. At this point the information I considering using advises us to use hot soapy water and then polish it up with Kiwi black shoe polish. It seems pretty safe as a starting point. Anyway, even if nobody has any answers for us hopefully this information is useful to you and you enjoy seeing the picture of our beautiful clock.